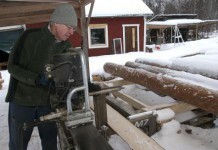 Maggie and Jim Birley started a sawmill more or less by chance. They bought a disused coal mine in order to build a house. 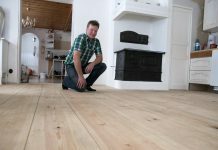 The result was Scottish Wood, a growing company with nine employees. 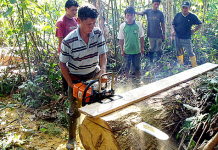 and since 25 hectares of forest was included in the deal, they invested in a sawmill for their own use. As the work progressed, the house build grew into a project with the aim of changing Scottish forestry as a whole. 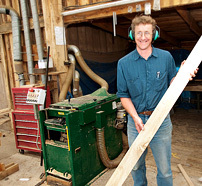 ”What we are lacking in Scotland is knowledge of how to cultivate and improve the forest,” says Jim. 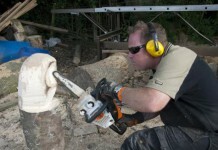 Felling and replanting of the traditional hardwood species, primarily oak and beech, has only taken place to a limited extent for building and carpentry. But Maggie and John Birley are well on their way to changing that. 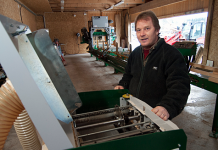 Together with other like-minded people, they have started the foundation Dynamic Woods, which owns the sawmill, and the network Association of Scottish Hardwood Sawmillers with some 30 members, all small-scale wood processors. 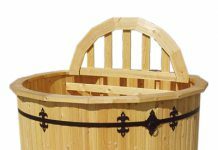 ”The foundation uses the profits from the sawmill for various projects in order to promote sustainable forestry in Scotland,” explains Maggie. 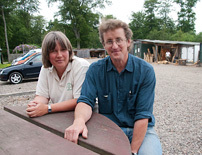 For Maggie and Jim, the most important thing is to improve and raise the profile of forestry in Scotland. 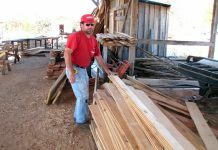 The sawmill that they originally started by chance has been a vital tool in this work, but the end in itself is not for the sawmill to grow. ”For several years we’ve said that we won’t get bigger, but demand is increasing all the time, and soon we won’t have room to grow any more,” says Jim. 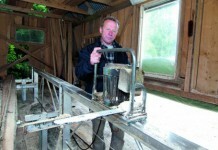 It’s an impressive piece of equipment that this couple have where other people would normally create a garden. Behind the family house there is a business that grows pile of wood by pile of wood, timber dryer by timber dryer. 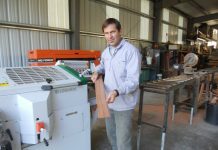 The heart of the business consists of two bandsaw sawmills and a 4-sided planer, the Logosol PH260. 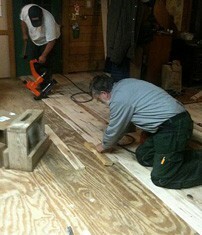 ”The 4-sided planer is a very good machine. We’ve had it for six years now and it’s used every single day.